How was your weekend? I hope you all had a good one! As usual on Mondays my refrigerator is quite bare and I am planning on cleaning out our freezer and shelves before I go for grocery shopping. I spent much of yesterday organizing our home and gave away lots of Nikolai's once treasured, but now forgotten, toys. I remember someone once told me that as our children grow older, their toys are smaller and typically fewer, but more expensive! 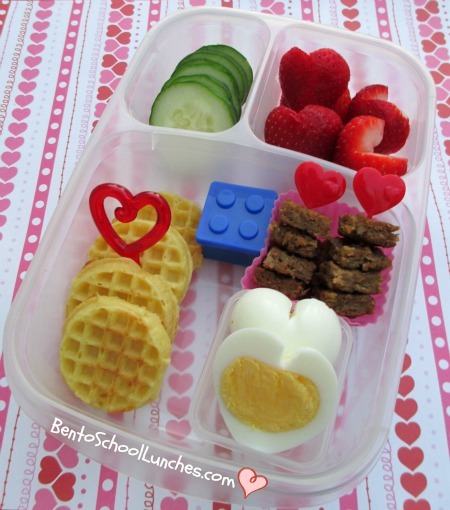 First time I am sending waffles to school with him and I included his favorite MorningStar Farms Veggie burger. I used frozen waffles, toasted them and heated the veggie burger in the microwave, super easy for a Monday morning. MorningStar Farms grillers veggie burger. I used our FubBites Cube it. Waffles and organic maple syrup in small container. Heart shaped egg that fits nicely into a Mini-dipper which isolates the egg smell from other foods. I used a heart shaped egg mold to mold the egg. Strawberries cut into heart shapes. Did you make the waffles yourself or are they store-bought?